Kaitlin Madriaga was born and raised on island of Maui. She graduated from King Kekaulike High School in 2009. She currently attends the University of Washington in Seattle, where she is studying biology and public health. 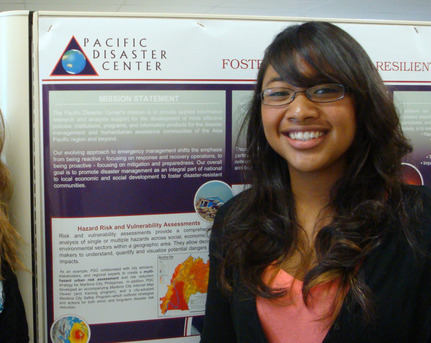 After graduating from college, she hopes to travel abroad and someday come back to Maui and work in a scientific or technical field. She enjoys traveling, shopping, playing music, and any water sports. Scientists can identify possible climate trends by tracking local weather data. This project acts as a first step in creating a reliable source of such information. We generated a global map that can define, establish, and monitor Global Climate-Change Indicator Sites. A set of climate-indicator sites were selected whose meteorological data span the past 40 years with information including frequency of hazards, population, and types of land cover. A total of 99 sites were chosen, each of which has a mixed type of land cover (no one type exceeding 75% of the whole area) and mixed human activity (~50% either urban or agriculture). A subsample of 25 sites was selected to display more detailed information on land cover and Normalized Derived Vegetation Index (NDVI) classifications. All sites also included data on temperature, precipitation, drought, and frequency of hazards. In order to collect proper spatial data, information was collected from existing networks such as the National Geospatial-Intelligence Agency and USGS. Using our Geographic Information System, downloaded satellite images were clipped down to 42 km ´ 42 km images. The clipped images were used for further land-cover analysis such as NDVI, which shows the amount of vegetation growing in a specific area. Meteorological data for these sites was measured and recorded once a month for 40 years, providing us with long-term, regularly sampled data. The map provides scientists and the public with a common database to monitor population, infrastructure, socioeconomic conditions, and natural hazards. The ultimate goal is to have an organized, interactive map that would be updated throughout future years.